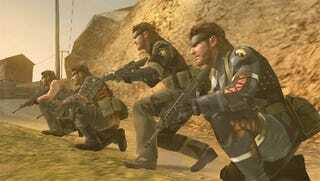 Snake's list of mortal enemies appears to have gotten a bit longer, as the latest issue of Famitsu reveals that upcoming PSP game Metal Gear Solid: Peace Walker will feature a surprise crossover that we certainly didn't see coming. According to early details from the Japanese magazine, Metal Gear Solid: Peace Walker will feature beasts and bosses from the Monster Hunter series. That's right, Snake and his fellow cooperative Snakes will be taking down giant Wyverns like the Tigrex and lesser creatures like Velociprey in addition to attack helicopters. Looks like Monster Hunter mascot Felyne will also make a cameo in Kojima Productions new Metal Gear game, with Snake cooking up some trademark monster meat-on-bone for sustenance. This would hardly be Metal Gear's first cross-company mash up. Solid Snake appeared in Nintendo's Super Smash Bros. Brawl, Sony's Ape Escape characters appeared in Metal Gear Solid 3, and Capcom and Konami have collaborated before with Boktai 2: Solar Boy Django, which can be linked up with a Mega Man Battle Network 5 on the Game Boy Advance. Expect more details following the Metal Gear Solid: Peace Walker event in Tokyo today.